The right sleeping bag can make the difference between a great camping trip and a miserable one. If you get cold and wet, the right bag can also ward against hypothermia. It is important to choose a bag that will keep you comfortable. If you’re normally warm, choose a bag rated about 10 degrees lower that the lowest temperature you will be camping in. If you’re normally colder, choose a bag that is rated at 20-25 degrees lower than the lowest temperature you will be camping in. 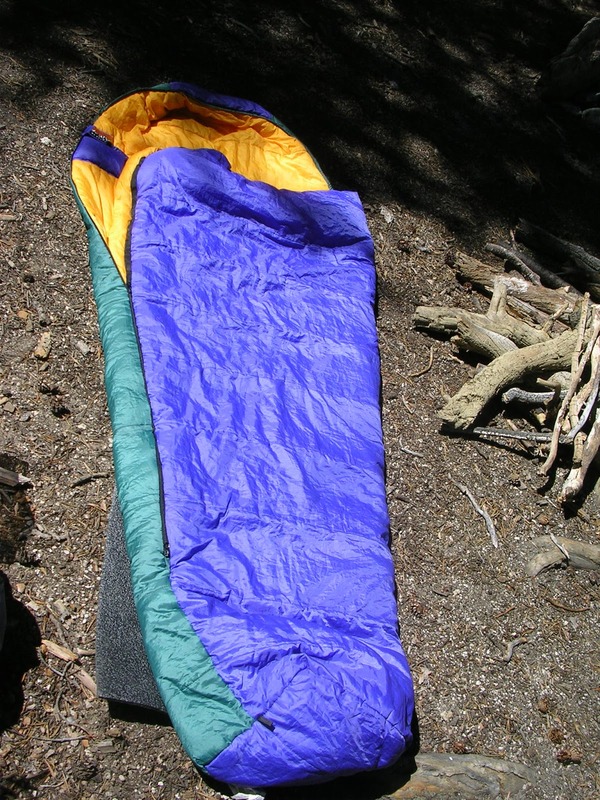 Sleeping bags can vary in price anywhere from $20 to 700 depending on a variety of factors such as temperature ratings, insulation, weight, shape and construction. Sleeping bag temperature ratings identifies the temperature at which the bag is intended to keep the average person warm. When a bag is described as a “0-degree bag”, it means that most users will be warm when the temperature goes no lower that 0 degrees. Important: manufacturers assume the camper is using a camp pad and wearing a layer of long underwear while using it. These ratings are not a guarantee of comfort, but a guide. There are 2 types of insulation: synthetic & goose-down. Many campers choose the synthetic insulation for the price and versatility. Synthetic insulation is less costly than it’s goose-down counterpart and insulates even when wet (it also dries quickly). If you camp with kids or animals (many dogs love camping! ), the synthetic insulation filled sleeping bag will hold up better. One downfall to synthetic insulation is that it does not compress down as much as goose-down which makes it less desirable for backpack camping. 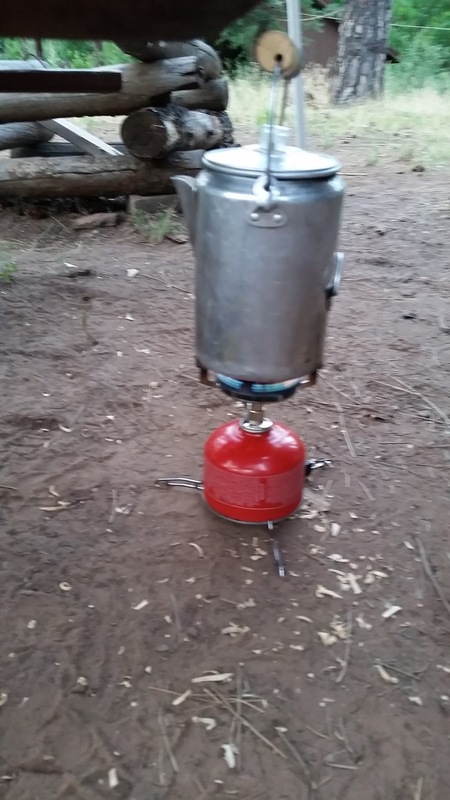 Weight is usually only a factor when backpack camping. When car-camping it doesn’t really matter how much your sleeping bag weighs, because often times the cot, dutch oven and other comforts usually weigh more! Sleeping bags that are lighter and have higher quality insulation will cost more, but bringing the right bag for the conditions will help you trim bulk and weight. The way a sleeping bag works is that once you’re inside, the bag traps the non-circulating air inside and your body heats it, keeping you warm. The less air inside, the quicker it will warm and less time for you to not be comfortable. Sleeping bags come in 3 basic shapes: rectangular, semi-rectangular, and mummy. -Rectangular bags are by far the most common shape of sleeping bag. This shape bag offers the most comfort and roominess. With all that “roominess”, it will take longer to heat the non-circulating air and therefore rectangular bags aren’t as efficient. One thing you can do with rectangular bags is zip two of them together (if they have the same size zipper) and make a double person bag. -Semi-rectangular bags, or barrel shaped bags, have a tapered shape and are more efficient than the rectangle shaped bags. These bags still offer comfort and roominess; just not as much as the rectangular bags. -Mummy bags have a narrower shoulder and hip width and taper down even at the feet. These bags are designed for the backpack camper as they are usually lighter and more efficient. Many people find it difficult to get comfortable in a mummy bag. -Double wide sleeping bags are basically rectangle shaped but are sold as basically 2 rectangular bags together. Many can be unzipped to make 2 separate rectangle bags. If you put a double-wide sleeping bag on a queen sized air mattress you and your sleeping partner are sure to be comfortable. Your sleeping bag’s outer shell is usually made out of nylon or polyester and the inside lining is not. The shell is designed to deflect water and the lining is designed to disperse body moisture. Some outer shells have a waterproof coating which can be tested with a wet cloth. Rub the wet cloth across the lining; and if the water beads, your bag has the waterproofing! A bag with high quality horizontal baffles are usually warmer and don’t have air leaks and keep you warmer. -Sleeping bag hood. Since campers loose the most heat through our heads, some manufacturers’ semi-rectangular bags have a built-in hood that is cinched with a drawstring to help keep you warm. If your bag doesn’t have a hood and you’re doing some cold weather camping, consider a fleece hood. I have one that is basically a hood that I can wear to help keep my head (and therefore the rest of me) warm in colder temperatures. -Sleeping pad sleeve. Some bags have a sleeve built-in to slide your sleeping pad in and not have to worry about slipping off the pad at night(something I seem to always do). -Small pocket. Some sleeping bags have a small pocket sewn into them for keeping your glasses, phone, flashlight, or whatever you need close by. -Inside collar. Some colder weather bags have an inside collar with an elastic drawstring designed to bring the lining around you and keep the warmed air inside. -Pillow pocket. There are some bags that have a pocket in them that is for inserting clothing to act as a pillow. I suppose you could also insert your camp pillow int one of these pockets as well. There are some accessories available that make caring for and transporting your sleeping bag easier. -Stuff sacks. Many bags come with a stuff sack, but in case yours didn’t, they can be purchased so you can easily transport your sleeping bag. Tip: Get a stuff sack that’s a little larger than what you need and throw your camp pillow in it. It won’t get lost that way! -Storage sacks. Instead of storing your sleeping bag all rolled up or stuffed into a stuff sack, hanging your sleeping bag fully unrolled will help prolong the life of the bag. When you store the sleeping bag in the stuff sack or rolled up, the insulation compresses and becomes less effective over time. -Sleeping bag liner. Sleeping bag liners can add to the warming effectiveness of your bag. They can add as much as 15 degrees of warmth to your sleeping bag! If you’re camping in really warm weather, leave the sleeping bag at home and just use the liner! Get a sleeping bag you can afford. A borrowed bag or inexpensive bag will still get you outside and camping. That really what matters! A $600 bag will make camp a little more luxurious, and if you can do it, by all means do. The most important thing is to be out there! That Tent Sleeps How Many? Tents come in all shapes & sizes. One of the great great mysteries of life for new campers is tent sizing. I’m often asked, “How is it that such a small tent is considered a 2-man tent?”. I used to wonder the same thing. I had a small “2-man” tent that had a footprint to 5′ x 6′ and used to wonder how 2 men could sleep comfortably in there. It turns out that tent manufacturers use the back packing tent capacity method. Self inflating sleeping pads are laid next to each other until no more will fit without overlapping. That’s how they figure it out. Granted, this does not make for roomy accommodations since sleeping pads are usually 20-22″ wide. To conserve weight, backpackers will often cram into a tent sleeping head to toe in mummy bags (this also conserves body heat in the winter). In this scenario, back packs and other gear are stored under the rain fly or just left outside if no rain is eminent. Most campers (me included) want a little more room than afforded by the backpacking style when camping with the family. Tent manufacturers adopt this model of capacity rating to make their product more attractive to buyers by increasing the sleeping capacity of the tent. One thing is for sure; if you sleep 4 people in a 4 person tent, there is no room for another living soul or their gear! This gives you a pretty good indication of just how many people you don’t want in your tent. I use the formula of “SSC-2” (where “SSC” = stated sleep capacity) and subtract 2. This will give you plenty of room for the number of campers and their gear without being right on top of each other. Depending on how much gear, the tent will be full but not too full. My son & I used to share a 4 man dome tent and we were comfortable. 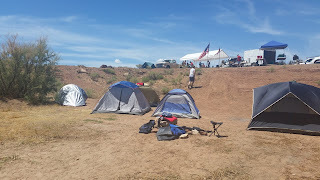 Our setup included a 2 cots, sleeping bags, back packs, and a cooler. We would set up the cots across from each other with the cooler in the middle serving as a sort of “night stand”. Our backpacks would fit easily under our cots so we had plenty of room. Obviously, tents with 4 sides (either rectangular or square) offer less sleeping area than the dome tents with 6 or 8 sides. With the dome type tents (and a rectangular sleeping bag) you have the space not taken up by sleeping bags for gear utilizing this “extra” floor space. The one exception to the SSC-2 rule is the 1 man “bivy” style tent. Obviously, you cant subtract 2 from a 1 man tent. I like a small bivy tent when out by myself or camping with the scout troop. It is big enough for me & my gear and not so big that my gear can get scattered around. Welcome to Camp Gear Center! This is where we will talk about everything camping; things we love, things we’d like to change, camp recipes, and some product reviews. Because we love camping so much, we decided to dedicate our lives to finding the best products and information to share with you. While we are out enjoying nature, we are compiling ideas to share and testing new products to review for you. Pull up a camp stool around the fire. Welcome to camp, we’re glad you’re here.